How to rule a country which is a target of war by the mad figurehead of a military junta in another country? This is not a historical question about Joseph Stalin’s options in August 1939, before he and Adolph Hitler decided on the time-buying ruse known as the German–Soviet Non-aggression Pact. Nor is this a current question about Bashar al-Assad and Syria, nor about Kim Jong-un and North Korea. It’s the question President Vladimir Putin is obliged to ask about Russia’s options facing a US regime in which, as the Kremlin now acknowledges, a military junta has installed itself behind President Donald Trump. “We have seen this all before”, Putin declared yesterday. If Putin has no doubt, then why the reluctance to decide what is to be done and the hesitancy to say so? Following the US attack on Syria, the Russian Defence and Foreign Ministries swiftly announced the results of their investigations, and also new policy measures, including the warning that US military deployments in Syria are now Russian targets. Putin is saying less. “Things like this should be thoroughly investigated. We plan to officially address the appropriate UN institution in The Hague and call on the international community to thoroughly investigate these matters. A weighted decision can then be taken depending on the findings of the investigation. Although they aren’t saying so publicly, the Russian Defence Ministry, the Foreign Ministry, the intelligence agencies and the security services know perfectly well from the case of the downing of Malaysian Airlines Flight MH-17 in Ukraine in 2014 that such an option leads to show trials for Russian culpability at the United Nations and in the international courts of Europe. Their advice to Putin is to stop proposing a ruse or an impossibility. Speaking of “political opponents of the incumbent president” and “international investigations” Putin is opening a door to indecision, retreat, and destruction, so the president has been advised. 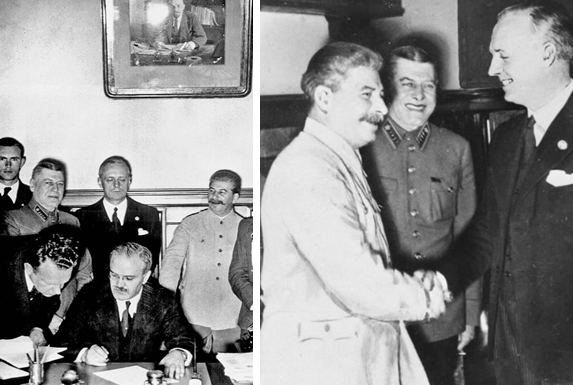 Left: Foreign Minister Vyacheslav Molotov signs, while standing directly behind him is German Foreign Minister Joachim von Ribbentrop, with Stalin to the right. Pictured right: Stalin and von Ribbentrop, with Chief of the General Staff Boris Shaposhnikov in between. Whether Putin will decide to shake the hand of Rex Tillerson, the US Secretary of State visiting Moscow today, and to smile as he does so, remains unknown as this goes to print. The current Chief of the Russian General Staff, Valery Gerasimov, will not be included in the group photographs. For one thing, the sources say, Russia’s forces are incomparably stronger now than they were in 1939; for another the Americans are incomparably weaker at home and on the war fronts than the Germans were. Finally, Trump can neither understand his generals nor control them. Hitler wasn’t as irrational or as impotent. So the grand strategy question again: how to rule Russia facing the US junta’s war on multiple fronts? Grand strategy answer – revive the State Defense Committee (GKO), put Russia on a war footing, and as Stalin did in 1941, redistribute the power Putin has so far kept to himself. Military rule, Russian style. 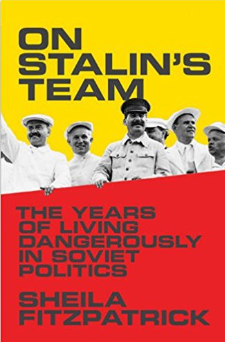 To understand how Stalin’s team worked before, during and after the world war, read this. The evidence of Stalin’s collective decision-making was gathered from newly released evidence, such as Stalin’s personal correspondence and his office meeting logs. One of the measures of collective decision-making at the top, in Stalin’s time as in Putin’s, is the use of the Russian addresses – the formal vy (Вы) and the informal ty (ты). A core group of five officials around Stalin exchanged ty with him. They were also the men who appear most frequently in the office diaries and the dacha records. After the war they became seven; by Stalin’s death, six. Nowadays there is the official Kremlin meeting log and the secret one. Subtract the time required for the events reported on the president’s website from the eight to ten hours of the president’s working day, and evidently at least half Putin’s meeting time is concealed. As for the question, with what officials or friends does Putin exchange ty rather than vy, the number and the names have almost never been reported in print. According to this two-year old publication, the ty count may be fewer for Putin than for Stalin. How many of Putin’s ty intimates are his friends in business – the cronies, according to the US Treasury’s Office of Foreign Assets Control (OFAC) – isn’t known. The one economic policymaker believed by Russian sources to use ty is Alexei Kudrin. Vladimir Yakunin, head of Russian Railways, exchanged ty with Putin until he was fired eighteen months ago. Igor Sechin, the powerful Kremlin advisor on natural resources and now chief executive of Rosneft, is reported to use vy with Putin; Alexei Miller, head of Gazprom, is reported to use ty. Kremlin spokesman, Dmitry Peskov, is reported to be “too afraid of Putin to use anything but vy”. On the morning of April 7, after the US attack on Syria the evening before, the Kremlin press service issued a statement at 0900. The Foreign Ministry followed with its statement at 10:27. The only official meeting Putin had that day, according to the Kremlin website, followed after midday when Putin met with the members of the Security Council. In the routine record-keeping of Security Council meetings, several photographs are usually posted showing officials seated by descending rank on each side of the table, with Putin at the head (pictured below, left) . Last Friday, however, only Putin appears in the photo record (right). Left: Security Council meeting on March 31 -- 10 attendees. Right: Security Council meeting on April 7 – 9 attendees. Foreign Minister Sergei Lavrov, absent from the second Moscow meeting, was in Tashkent for a session of CIS foreign ministers. Of the Security Council attendees only two – Prime Minister Dmitry Medvedev and former presidential chief of staff Sergei Ivanov – have been overheard using ty with Putin. The forms of address between Putin and the other eight remain a state secret. The new head of the Russian desk on the US National Security Council, Fiona Hill, acknowledged in her 2013 report on Putin that she and her sources hadn’t asked, and didn’t know. While US military threats are now intensifying the internal pressure on Putin to adopt more of the Stalin posture – that’s the collective approach of the war period – and overcome his bouts of isolation and indecision, what would the domestic Russian reaction be if Putin moved in Stalin’s direction, and the Security Council became a war-fighting GKO? The answer, according to this nationwide poll by the Levada Centre last July, is more positive than negative – and much more positive than the US and its allies in Europe and Asia are calculating. For the Levada poll results, read this.